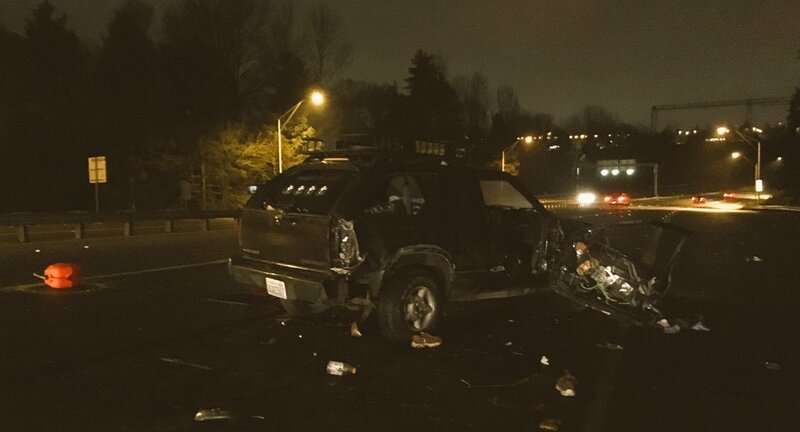 A man standing by a vehicle on the side of the highway was struck and killed in a hit-and-run crash overnight near SeaTac, according to the Washington State Patrol. The incident occurred at the on-ramp to eastbound Highway 518 from Des Moines Memorial Drive South. A State Patrol investigation found that the victim, a 44-year-old passenger in a black 1996 Chevy Blazer SUV, was standing next to the vehicle after it had run out of gas. Then, a truck hit him and the side of the SUV. That truck then fled the scene heading east on Highway 518. Troopers are looking for a work or utility truck with heavy damage to its left side. The crash sheared off the side of the SUV, and the hit-and-run driver’s truck was damaged enough that it struggled to leave the scene. The surviving SUV driver said the truck had several toolboxes and a winch. The truck lost a bag of rugby equipment that landed on the roadside during the crash. RELATED: What Should I Do If I Am Injured In A Hit-and-Run Accident? RELATED: How Will My Car Insurance Be Affected In A Hit-And-Run Accident? Why Do Hit-And-Run Drivers Flee The Scene? Leaving the scene of an accident likely means far more trouble for the driver than if they had just stayed to take responsibility for their actions. So why do so many drivers flee? Statistics show that some hit-and-run drivers are under the influence of alcohol or drugs, which impairs their decision making. If someone has been drinking and driving, they may have a fear that being caught. Other people already in trouble with the law may flee the scene with the hopes that it won’t make their record worse. Someone with an outstanding warrant may run away after an accident, however irrational that is. Dr. Paul Clements, a forensic clinical specialist and professor at Drexel University, says hit-and-run drivers downplay the severity of the situation to rationalize leaving the scene. People with nothing to hide from police flee because they are afraid. Factors such as fear, immaturity, shock, shame, etc. play into a person’s choice to run away from their problems. According to a AAA study, hit-and-run drivers kill about 1,500 people each year. If you or a loved one has been the victim of a car accident, contact Davis Law Group P.S., immediately. Attorney Chris Davis has represented many victims of hit-and-run accidents in Washington State, fighting to get the families the compensation they deserve. Call Davis Law Group at (206) 727-4000, use the chat feature below or fill out the form on this page for a free case evaluation.